Schnaudt, Christian 2019. Political Confidence and Democracy in Europe. p. 21. Schnaudt, Christian 2019. Political Confidence and Democracy in Europe. p. 219. Schnaudt, Christian 2019. Political Confidence and Democracy in Europe. p. 271. Dageförde, Mirjam Kerrouche, Eric and Poyet, Corentin 2018. Political Representation in France and Germany. p. 227. Wolak, Jennifer 2018. Feelings of Political Efficacy in the Fifty States. Political Behavior, Vol. 40, Issue. 3, p. 763. Algara, Carlos and Zamadics, Joseph C. 2018. The Member-Level Determinants and Consequences of Party Legislative Obstruction in the U.S. Senate. American Politics Research, p. 1532673X1881240. Spiteri, Jonathan and Briguglio, Marie 2018. Governance and Regulations’ Contemporary Issues. Vol. 99, Issue. , p. 121. Hitt, Matthew P. and Searles, Kathleen 2018. Media Coverage and Public Approval of the U.S. Supreme Court. Political Communication, Vol. 35, Issue. 4, p. 566. Ramirez, Mark D. and Lewis, Paul G. 2018. Beliefs About Corporate America and the Structure of Opinions Toward Privatization. Political Behavior, Vol. 40, Issue. 4, p. 1011. Schöne, Helmar 2018. Soziologie der Parlamente. p. 35. English, Ashley Pearson, Kathryn and Strolovitch, Dara Z. 2018. Who Represents Me? Race, Gender, Partisan Congruence, and Representational Alternatives in a Polarized America. Political Research Quarterly, p. 106591291880604. Citrin, Jack and Stoker, Laura 2018. Political Trust in a Cynical Age. Annual Review of Political Science, Vol. 21, Issue. 1, p. 49. Galais, Carol 2018. Conflict frames and emotional reactions: a story about the Spanish Indignados. Journal of Elections, Public Opinion and Parties, p. 1. Hansford, Thomas G. Intawan, Chanita and Nicholson, Stephen P. 2018. Snap Judgment: Implicit Perceptions of a (Political) Court. Political Behavior, Vol. 40, Issue. 1, p. 127. Ansolabehere, Stephen D. and White, Ariel 2018. Policy, Politics, and Public Attitudes Toward the Supreme Court. American Politics Research, p. 1532673X1876518. Guenther, Scott M. and Searle, David M. 2018. Limited Time, Limited Resources: Trade-Offs in Congressional Earmarking and Policymaking. American Politics Research, p. 1532673X1876388. Lorenzano, Kyle John Sari, Miles Storm, Colin Harrell Rhodes, Samuel and Borah, Porismita 2018. Challenges for an SNS-based public sphere in 2016. Online Information Review, Vol. 42, Issue. 7, p. 1106. Maier, Jürgen and Jansen, Carolin 2018. Steigert die Rezeption von TV-Duellen das Vertrauen in die Spitzenkandidaten?. Zeitschrift für Politikwissenschaft, Vol. 28, Issue. 1, p. 1. Hamel, Brian T. and Miller, Michael G. 2018. How Voters Punish and Donors Protect Legislators Embroiled in Scandal. Political Research Quarterly, p. 106591291878104. This timely book describes and explains the American people's alleged hatred of their own branch of government, the US Congress. Intensive focus group sessions held across the country and a specially designed national survey indicate that much of the negativity is generated by popular perceptions of the processes of governing visible in Congress. 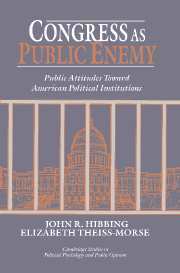 John Hibbing and Elizabeth Theiss-Morse argue that, although the public is deeply disturbed by debate, compromise, delicate pace, the presence of interest groups, and the professionalization of politics, many of these traits are actually endemic to modern democratic government. Congress is an enemy of the public partially because it is so public. Calls for reform, such as term limitations, reflect the public's desire to attack these disliked features. But the authors conclude, the public's unwitting desire to reform democracy out of a democratic legislature is a cure more dangerous than the disease. 1 - Introduction: What is wrong with the American political system? 6 - Who approves of Congress?